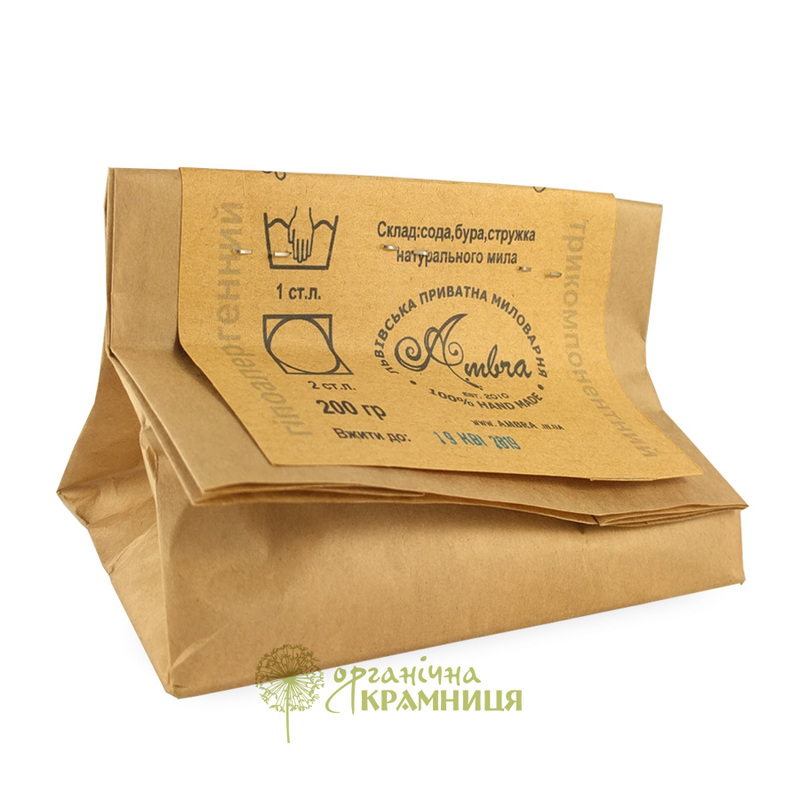 Ukrainian brand Ambra (Lviv Private Soap Factory) presents natural hypoallergenic baby washing powder. It is a 100% handmade product that contains only a bare minimum of ingredients that help to keep your clothes fresh and clean. They are baking soda, borax and shavings of natural soap. Phosphate-free. Phosphate-free laundry detergent by Ambra is an effective and affordable product. It is suitable for both manual and machine wash. Due to containing only natural ingredients, it is completely safe for your health and the environment. The product doesn't irritate the skin or cause allergic reactions. The laundry detergent is suitable for washing different fabrics. It gently removes dirt and stains without damaging the fibres. It is easily washed out during rinsing, which helps to save time and makes your clothes last longer. Ambra's natural washing power is free of phosphates, fragrances, aggressive anionic surfactants, chlorine, phthalates and other potentially harmful or even dangerous additives. One of the product's key ingredients is natural soap shavings. Soap acts as a mild, but effective detergent and easily removes dirt. Baking soda softens the water, enhances the effect of soap and keeps fabric from fading in the wash. Borax (sodium borate) also produces a softening effect on the water. This ingredient regulates the alkalinity of soap and preserves its detergent effect even in lukewarm or cool water. Directions. Use 1 to 3 tbsp powder depending on the amount of laundry (3 tbsp powder for 5 kg laundry). Suitable for manual and machine wash. Ingredients. Sodium Bicarbonate (Baking Soda), Sodium Borate (Borax), Natural Soap Shavings. Want to buy Natural Hypoallergenic Baby Washing Powder? Call us or submit your order via our web site!